Highlights include: principal’s award recipients, sports news, 100 year celebrations, centenary countdown, winter raffle winners. A panoramic photo of the senior school taken this week during the gumboot throwing final with Whero taking out first place. Students are placed into Whanau groups with other family members when enrolled at school. 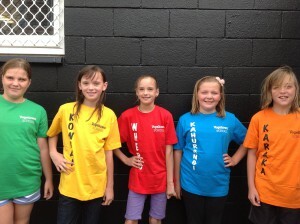 Several Whanau events are held each year ranging from the competitive cross country and triathlons to the lets-not-take-ourselves-too-seriously Whanau sing-off .You can purchase Vogeltown Whanau T-shirts (kids sizes 6 – 12) at the office for $20.00 each.